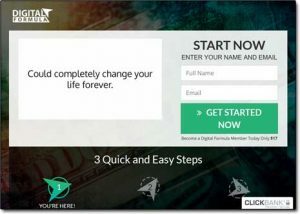 Digital Formula Review – The Whole System Is a SCAM In My Honest Opinion! You’re led to believe that you can simply sign up, follow some step by step instructions & begin profiting by as much as $2,254 per day… But it all sounds a little far fetched don’t you think? So what’s the deal, is it really legit or will the Digital Formula scam you instead? What Exactly Is The Digital Formula System? Neil, the creator wants you to believe that you can easily make as much $2,254 per day from the system. He says that with just 5 minutes of work you can have $2,254 rolling everyday like clockwork, and that you can even earn your first $2,254 within just 24 hours of signing up. So I know what you’re thinking – what’s the catch? Well it’s a good job you asked because there’s a very big catch indeed. The catch is that the whole thing flat-out doesn’t work as promised… But come on, did you really think you were going to get access to an automated way of making $2,254 per day for just $17? The only person that’s really going to making money from this “system” is the person that’s behind it all (which isn’t Neil Carter by the way – that’s just a fake name). Sadly he or she will be making money at your expense – and you’ll just be left to find out the hard way that it doesn’t really work as promised. The reason I can say that so confidently right from the off is because I’ve seen this exact same type of scam several times before launched under various different names such as Crypto Cash For Beginners & Crypto Coin Sniper. Obviously though I don’t just expect you to take my word for that though so instead let me show you how it all really works so that you can see for yourself what’s actually going on – and why it won’t work as promised. How Does The Digital Formula System Work? In short – just in case you happen to have skipped straight down to this part of the review, it simply doesn’t work as promised. Rather than helping you to make money like it claims it will, in reality the only thing the Digital Formula system will do is take money from you instead. And whilst it claims to only cost $17 to get access to, you can expect to be asked for a LOT more on the inside. The reason I know that is because as shown below the Digital Formula is listed on an affiliate network & its owners are paying up to $316.80 in commissions for each new customer that affiliates refer. It says the commissions paid out to affiliates are 60%, so if that holds true then as a customer in total the whole program would set you back $528! That’s a big jump from the seemingly small entry fee of $17. So as a member you could basically expect to be hit by upsell after upsell on the inside… But I know what you’re wondering – what do you actually get access to on the inside?? Well, the truth is there is no “system” as such after all. Instead after handing over the cash to gain access (which I don’t recommend) you’ll find out that all you get access to is some very basic training on cryptocurrency investing. This is training that you can find elsewhere online for free. Basically the gist of what they “teach” you (if you can really call it that) is searching for newly launching cryptocurrencies, investing whilst they are super low – and then hoping that they dramatically increase. The reality is though that since Bitcoin there have been VERY few coins that have risen so greatly in value. I mean sure, a few – such as Ethereum and Ripple have risen quite a lot… But it’s taken them a long time to do so, and these are just 3 out of literally thousands of currencies. 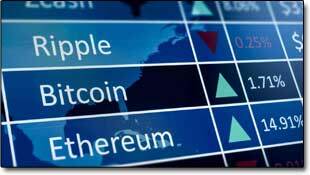 The chance of you investing in a brand new currency and making a ton of quick cash is slim to none. Sorry to be the one to burst the bubble but honestly that’s the harsh truth of it all. They just want to make it seem easy to get you to hand over your cash. If it really was as easy as they made it out to be then they’d be trading cryptocurrencies themselves rather than suckering people into a program & pressuring them to part with their cash. The good old saying “if it sounds too good to be true, it probably is” comes to mind here. I mean, like I mentioned earlier in this review – if somebody had a legitimate way to make $2,254 per day do you think they’d be sharing it for just $17? The reason they’re charging $17 is because its low enough for you to think “I’ll just try it out”, and it’s also low enough for you to not bother messing about trying to get a refund when you find out it doesn’t really work. On the inside they’ll of course try and con you into higher levels of the program, which some people will likely end up purchasing – but most won’t, however similarly most won’t bother seeking a refund on their $17 either… They’ll just cut their losses. If the guys behind the whole thing can just get a mere 1,000 people each month to “try the program out” they’ll be raking in $17,000… And that’s not even taking into account all the upsells inside. So like I say the whole things just a trick to part people with their cash. The disclaimer at the bottom of their website which reads “Do not take this information as professional investment advice” says it all. The reason they put that there is because they basically know the information that they’re giving you through the program is junk. There’s no way you’ll earn anywhere near $2,254 per day – heck you’d be lucky to make as much as $1 per day. The true likelihood is that you’ll just LOSE money, not make it. 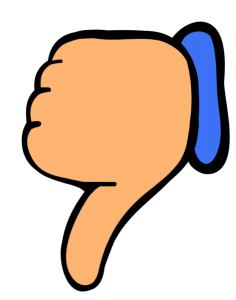 My Verdict – Is Digital Formula a Scam? Some people might say it’s not a scam because technically even though it’s junk, you do actually get access to something for your money (some training)… But in my opinion the whole thing is a scam because it’s totally misleading. You’re essentially tricked into thinking that you’ll just be able to sign up & start making lot’s of money right away with very little work & next to no work but that just hands down isn’t true & that’s why in my opinion it’s a scam. It’s been solely designed with the intention of making its creator wealthy at your expense – not to make you wealthy like it claims. So for those reasons there is simply no way I’ll be recommending it. The truth is though you can actually make good money online – in fact you can indeed even make thousands of dollars per day… But it takes work, it’s not just going to happen on autopilot like these BS systems make out it will. The good news though is that if you are prepared to put in the work then you can sign up at a legitimate place such as Wealthy Affiliate & learn the steps you need to take to begin making real money online. It’s there that you’ll find proper success. You just need to understand that the internet isn’t magical. I mean yes you can make good money, yes it can even become passive… But it’s not going to happen overnight & it’s not going to happen without work. But whatever you decide to do it’s up to you – I just hope that my review of the Digital Formula system here has given you a better insight into how it works (or should I say doesn’t work) & hopefully it has helped you save some cash. Mommy Jobs Online Review – Scam or Legit?